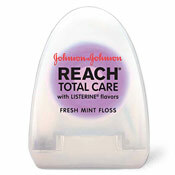 Dr. Oz says he uses Reach Total Care ($3.29). We say use whatever feels most comfortable to you, but he is the most trusted medicine man on TV today. It's something so simple, that adds anywhere from two to ten years to your life ... and yet many of us don't floss daily. Why? Because it's kind of a drag. Because we see a little blood. But it doesn't matter how vigorous or thorough you are about your brushing, you're still missing a good portion of your teeth's surface area. That'll help with the bad breath, but how does flossing save your life? The bacteria that lingers in an un-flossed mouth can start working its way into gums and cause inflammation and infection. This increases your body's immune response along with your risk of heart disease, diabetes and even heart attacks. The best time to floss? At night, before you brush. Slide the floss under your gum line, curling it around each tooth. And don't give up because your gums bleed—they'll get used to it and you'll stop seeing red in the sink. Do it nightly for two weeks and you'll have developed a solid habit. The percentage of Americans who actually floss daily.